1.Preheat an oven to 375 degrees F (190 degrees C). Grease 12 muffin cups, or line with paper muffin liners. 2.Combine the oat bran and wheat bran in a large bowl. Stir in sour cream and milk. Allow mixture to stand for 10 minutes. Combine flour, baking powder,baking soda, brown sugar, and salt in a separate bowl. 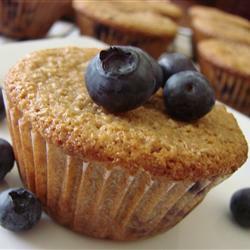 Gently stir blueberries into the flour mixture, carefully coating all the blueberries with flour. Stir vegetable oil, orange juice and zest, egg, and vanilla extract into the bran mixture. Combine flour mixture with the wet ingredients until just blended. Drop batter into lined muffin cups. 3.Bake in the preheated oven until a toothpick inserted into the center comes out clean, 15 to 20 minutes. HEAT oven to 400°F.COMBINE first 5 ingredients. Stir in 1/2 cup mozzarella; spoon into shells. SPREAD half the sauce onto bottom of 13×9-inch baking dish. Place shells in dish; top with remaining sauce and mozzarella. Cover. BAKE 40 min. or until heated through, uncovering after 30 min. This luxurious treat has a brownie crust, a creamy filling and two ganache toppings. For a dairy-free version, make Dairy-Free Chocolate Cheesecake with dairy-free variations of Brownie Crust and chocolate ganache toppings. 2. Break both types of chocolate into pieces and melt over hot water or in the microwave. Set aside. 3. Beat the cream cheese until fluffy, scraping the sides and bottom of the bowl. Add sugar and continue beating for a few minutes. Add eggs one at a time, beating until incorporated, scraping the sides and bottom of the bowl. Beat in the vanilla. Mix in the cream. Slowly stir in melted chocolate until ingredients are combined. 4. Pour filling into cooled prebaked crust. 5. Place cheesecake in preheated oven and bake on middle rack for 2 hours or until sides feel firm and the center is soft like baked custard. Begin checking after 90 minutes. Internal temperature should be 150 degrees. 6. Turn oven off. Leave cheesecake in oven with door propped open for about an hour. 7. When cool, top with milk chocolate ganache. Then top with dark chocolate ganache. Recipe from the past that was requested…. 1 piece equals 502 calories, 33 g fat (11 g saturated fat), 142 mg cholesterol, 277 mg sodium, 45 g carbohydrate, 2 g fiber, 8 g protein. Preheat oven to 375°. Line a 9-in. deep-dish pie plate with pastry. Trim and flute edges. In a small bowl, beat cream cheese, sugar, 1 egg and vanilla until smooth. 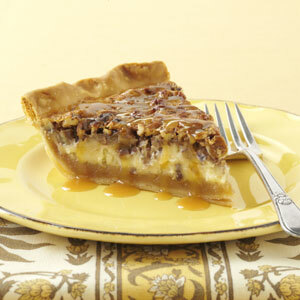 Spread into pastry shell; sprinkle with pecans. In a small bowl, whisk remaining eggs; gradually whisk in caramel topping until blended. Pour slowly over pecans. This is the simplest peach cobbler one can imagine and so delicious….. Place a scoop of ice cream on top and you are in peaches cobbler heaven…yummy!! In the 350* oven I place my casserole dish with the 2 sticks of butter to be melting…. In a separate bowl I pour one cup of flour, one cup of milk and one cup of sugar and stir well until smooth and creamy…..
Cook until you have a crust on top about 40 minutes. Serve with a scoop of ice cream!!!! Yummy! !